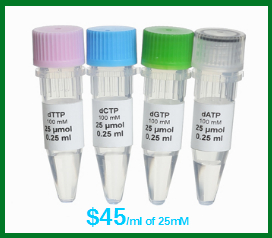 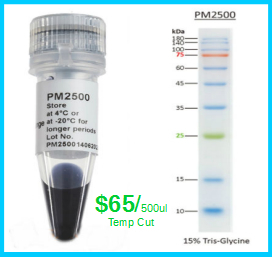 Our ExcelBand 3-color Pre-stained Protein Marker (Cat# PM5000) is a regular range, ready-to-use three-color protein marker with 13 pre-stained proteins covering a wide range of molecular weights from 10 to 180 kDa in Tris-Glycine Buffer (9 to 170 kDa in Bis-Tris (MOPS) buffer and 10 to 170 kDa Bis-Tris (MES) buffer). 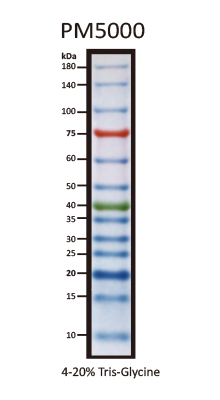 Proteins in this pre-stained protein marker are covalently coupled with different chromophores for easy identification of bands, with three reference proteins carrying enhanced intensity corresponding to a blue band at 20 kDa, green at 40 kDa, and red at 75 kDa, respectively, as separated on SDS-PAGE (Tris-Glycine buffer). 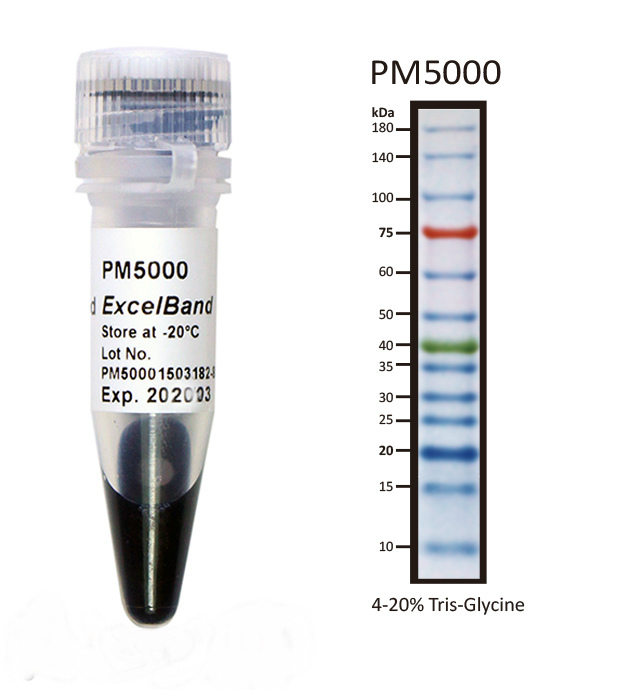 The PM5000 ExcelBand 3-color Pre-Stained Protein Marker Regular Range is designed for monitoring protein separation during SDS-polyacrylamide gel electrophoresis, verification of Western transfer efficiency on membranes (PVDF, nylon, or nitrocellulose) and for approximating the size of proteins. 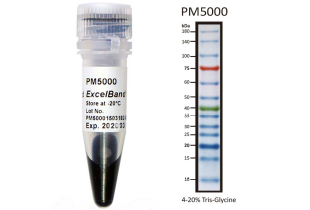 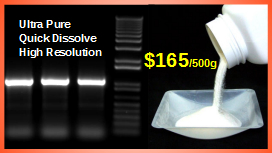 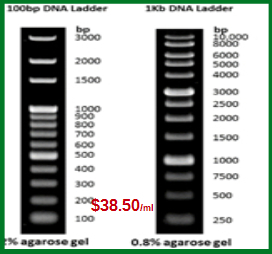 Under suggested conditions, PM5000 ExcelBand 3-color Pre-Stained Protein Marker Regular Range resolves 13 major bands in 15% SDS-PAGE (Tris-Glycine buffer) and after Western blotting to nitrocellulose membrane. 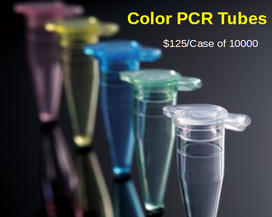 The shipping cost for each order placed is $6.50, but will be automatically waived at checkout on orders of $200 and up.